A novel set within the Zombie Apocalypse! 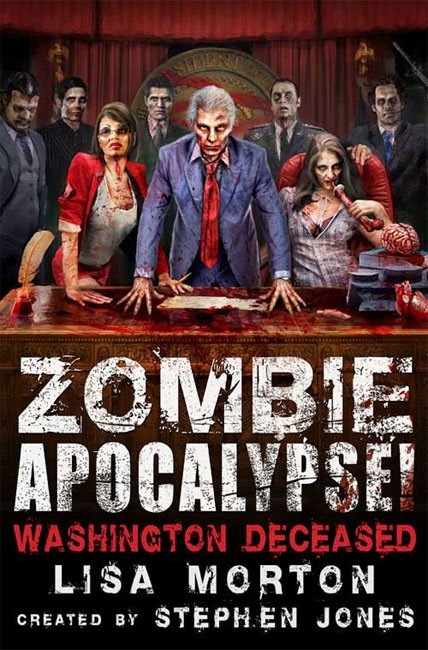 mythos created by Stephen Jones for his bestselling trilogy,Washington DC is sent during the second half of Zombie Apocalypse! Fightback, when the zombies’ intelligence is increasing and they have formed themselves into a society, and an army. New York and Los Angeles have fallen to the walking dead and there has been no news out of Chicago, but Washington DC is still holding out and the South is still free. Time is running out, though, for the battalions defending Capitol Hill . . .
As the most powerful symbols of American democracy begin to fall, the President and her advisors must be protected at all costs. But what if there are people in her own government who are prepared to do a deal with the living-dead invaders to retain power at any cost? Meanwhile, ‘Zombie King’ Thomas Moreby is making his own plans to rule the United States as his control increases across the country. Moreby claims to have ‘foreseen’ his victory, but there are emerging factions in his own ranks who are starting to question their role in the war between zombies and humans. And how does the mysterious New World Pharmaceuticals fit into the New Zombie Order? Wow, wow, wow, wow! First of all, the opening letter is fantastic and plays on so many conspiracy theories of Washington. Second of all, it's a damn good zombie novel. If you love zombies and stories built from author-altered history, you'll love this book. I highly recommend it.